= Islaya copiapoides Rauh & Backeb. Descr. Cact. Nov. 33. 1956 Backeb. Accepted Scientific Name: Eriosyce islayensis (C.F.Först.) Katt. 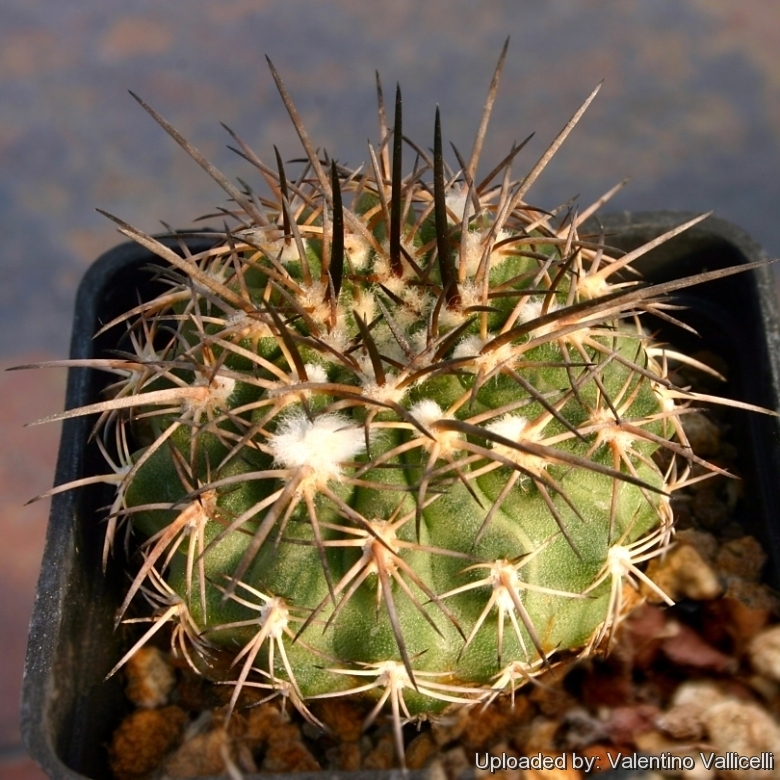 This interesting plant has a large stem and strong beautiful spines remembering a Copiapoa, hence the species name. Origin and Habitat: Rio Ocoña to Camana, Southern Coast of Arequipa in the middle of Islaya territory, Peru. Altitude: 100-300 metres above sea level. Habitat: Grows together with Haageocereus decumbens in very dry desert areas where it almost never rains and where only the occasional sea fog drift inland. Islaya copiapoides Rauh & Backeb. Islaya grandis Rauh & Backeb. in Backeb. Islaya brevicylindrica Rauh & Backeb. Islaya grandiflorens Rauh & Backeb. Islaya grandiflorens var. spinosior Rauh & Backeb. Islaya grandiflorens var. tenuispina Rauh & Backeb. Islaya grandis var. brevispina Rauh & Backeb. Islaya paucispina Rauh & Backeb. Islaya paucispina var. curvispina Rauh & Backeb. Islaya paucispinosa Rauh & Backeb. Description: Eriosyce islayensis, (syn: Islaya islayensis), is a small globose to cylindrical cactus with very woolly areoles end dark spreading spines, it is indeed very variable and has received many names, but it is clear from fieldworks that the different wild populations constitute a single but multiform species. Islaya copiapoides has fewer spines, but is generally included within (as a synonym of) Eriosyce islayensis, suggesting that there is not really a fundamental difference between the two. Stems: Grey-green, 5 to 40 cm tall (or more long), 5 to 20 cm in diameter. Ribs: 19 to 25 low and obtuse. Areoles: Approximate, large, very woolly, with grey-brown felt. Spines: Variable in colour, horn-coloured, brow to shiny black, turning grey as they age. Central spines: 4 to 7 spreading, thick, 12-16 mm long. Radial spines: 12 to 22, shorter, radiating, (1-)6-10 mm long. Flowers: Diurnal, 1,5 - 4 cm long and in diameter, born on younger areoles from a yellowish woolly crown in summer, wide funnelform, yellow, outer perianth segments often reddish, floral tube short with tufts of dense wool and long reddish bristles. Fruits: Characteristic, up to 5 cm long, club shaped, balloon-like, pinkish to red, openings at maturity by basal pores. Pericarp initially fleshy but the interior always dry when mature. Islaya brevicylindrica Rauh & Backeb. : has short cylindrical stems. Distribution: Rio Ocoña to Camana, Southern Coast of Arequipa, Peru. Islaya copiapoides Rauh & Backeb. : has few stout spines. Distribution: Rio Ocoña to Camana, Southern Coast of Arequipa in the middle of Islaya territory, Peru. Islaya copiapoides var. chalaensis F.Ritter: Has fewer very strong spines. Distribution: North of Chala, along the coast and inland of Arequipa, Peru in the middle of Islaya territory. Islaya divaricatiflora F.Ritter: It has mostly red-violet flowers and shorter spines. Distribution: Camana and adjacent areas, Arequipa, Peru. Islaya grandiflorens Rauh & Backeb. : has large flowers (the larger of the Islayas) and white wooly crown. Distribution: Chala to Tacna, Southern Coast of Arequipa, Peru. Islaya grandiflorens var. spinosior Rauh & Backeb. : has large yellow flowers and many strong spines. Distribution: Chala, Southern Coast of Arequipa, Peru. Islaya krainziana F.Ritter: has strong somewhat columnar stems that can reach 75 cm high (the taller of the islayas). Distribution: It is the only Chilean population of "Islaya", located around Poconchile above Arica, very near the Peruvian border. Islaya longicarpa Kníže: has very long fruits. Distribution: along the coast near Atico, Peru. Islaya maritima F.Ritter: Distribution: Atico, Peru. Islaya paucispina Rauh & Backeb. : is similar to "lindleyi" and "chalaensis" (if not the same) but usually with stronger spines. Distribution: Chala, Peru. Islaya solitaria n.n. : has often solitary spherical or cylindrical stems up to 20 cm tall and 10 cm in diameter, lime-blue or grey-green. Distribution: Camana Pampa, Peru. Neoporteria lindleyi C.F.Först. : has fewer and shorter spines. Notes: Eriosyce islayensis has a large area of distribution and is a very variable species. The difference between populations is the frequency of the appearance in which these forms do occur. So it is possible that two individuals of two different populations can look very similar and also, that two plants of the same population can look very different. However when you are looking at the whole population, you can see the difference between one population and another. 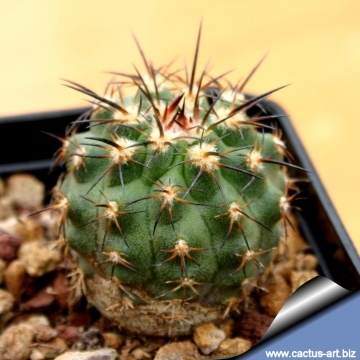 Cultivation and Propagation: It is an extremely xerophytic, summer-growing, species adapted to very dry soils that, like many cacti of the Peruvian deserts, present some problems in cultivation. It is in fact somewhat rot prone if kept in a non ventilated place. Soil: It requires a very fast draining drying open mineral, sandy-gritty cactus composts. Provide a very good drainage. Propagation: Usually propagated from seeds (seldom produces offsets) or graft. The seeds can be sown in pots of fine, well-drained sandy soil, any time during the spring when temperatures are warm. Cover the seeds with a fine layer of grit and water from below with a fungicide to prevent damping off. For the 1-2 weeks cover the pots with a sheet of glass/clear perspex to keep the humidity levels high. Remove the glass and replace it with light shade-cloth and mist once or twice a day for the next two weeks after which most seeds should have germinated. From then on mistings can be reduced to every second and then every third day as the little plants grow. The seedlings should not be disturbed until they are well rooted after which they can be planted separately in small pots. Sometimes it is grafted onto a strong grafting stock like Selenicereus sp. to avoid root rot problems as plants grafted on an hardy stock are easy to grow and no special skill is required. Such grafted seedlings can be been successfully cultivated for years. Mature plants imported from the native habitats usually did not take roots and dyes in a few months.